Stretch it out, SLEEPY HOLLOW fans. It’s hard work being a witness in the battle between good and evil, and Abbie thinks that yoga could be just what she and Ichabod need — not only to relieve stress, but to strengthen themselves for the fight ahead. Of course, Ichabod hates it, but his hair stays loose and curly for a good long while, so it’s not a total loss. Every week is Halloween on SLEEPY HOLLOW, but this episode feels especially suited to the season, doesn’t it? The Weeping Lady is classically spooky. She’s a local legend made real, and she has a connection to Crane. Moloch could probably play Six Degrees of Ichabod Crane with his whole army at this point. 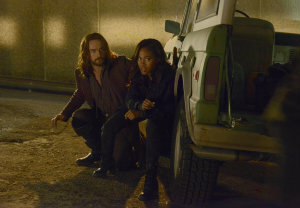 SLEEPY HOLLOW fans, in case you were worried, this episode put two fears to rest right at the start. First of all, Ichabod Crane’s disdain for banks isn’t going anywhere. Second, no jail cell can hold Jenny Mills for long; Abbie got her out in exchange for community service. But of course, when one problem is solved, three new ones crop up. Grab your stained glass, and let’s get to it.